I love how easy this idea is, just a couple of things tossed in a food processor. 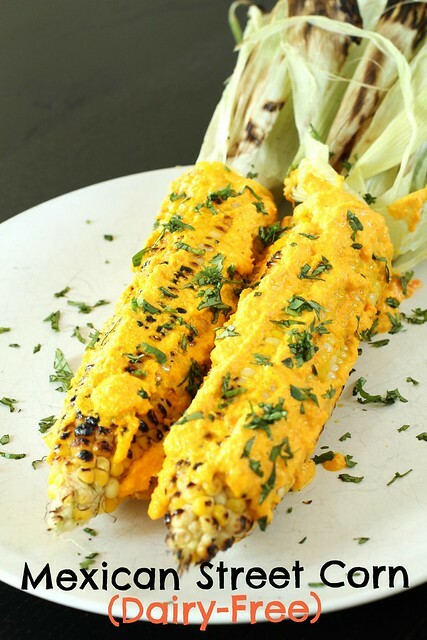 The result is garlicky, rich, and satisfying on some good sweet corn just like the traditional Mexican Street Corn known as Elotes, yet without the dairy! As much as I want cheese on everything, I love this recipe and didn’t feel like I was missing out on anything. For those that entertain, you’ll appreciate a recipe that is vegetarian and dairy-free and will satisfy most. Good thing this recipe will also double, triple, and quadruple easily. 1. Preheat the grill. Peel off and discard outer leaves of the corn, leaving about two inner layers. 2. Soak the corn in water for 10 minutes. 3. While the corn is soaking, place mayonnaise, carrot, garlic, salt, and cayenne in the bowl of a food processor and process until it forms a paste that may have little lumps. You make have to scrape down the bowl a few times. Set aside. 4. Grill the soaked corn for 10 minutes, turning occasionally. 5. 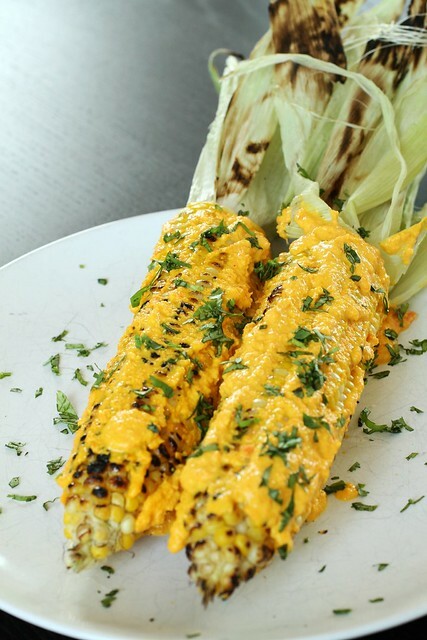 Remove the corn from the grill and shuck completely. Return the corn to the grill and grill for another 6 to 8 minutes, turning occasionally, until the kernels look cooked and golden with some nice charring. 6. Slather the sauce generously over the corn and sprinkle with cilantro (if using). Serve immediately. posted by jessica	at 09:39 AM	Filed under Fusion, Inventive, Recipes. You can follow any responses to this entry through the RSS 2.0 feed. Both comments and pings are currently closed. My wife is Taiwanese and I am the cook at home. I used to cook professionally, but now I am an engineer and I cook for my family daily. I looked for your recipe but could not find one for a dish I have tasted here and also in Taiwan called Lu Rou Fan (braised pork and egg on rice). Your recipe for the mustard green relish is essential for the right taste for this dish. I am hoping that you will share your recipe for Lu Rou Fan. I have 2 young kids and I know how tough it is to find time, but I like to challenge their taste buds with new recipes when I can. I found your recipe, you spell Lo Ro Fan differently than the way I found it spelled elsewhere. Other dishes that I like to cook are Ma Po Tofu and Boiled Chicken with Diacon Radishes. I am also looking for a good Beef Noodle Soup recipe. When done correctly it is absolutely wonderful. Marc, glad you found Lu Ro Fan…I know the whole spelling thing is tough when I’m trying to translate from Chinese. =( I do have the recipe for Ma Po Tofu but I don’t know Boiled Chicken with Daikon Radishes. Marc, this is the basic recipe for Taiwanese Beef Noodle Soup that my mom taught me. I have since experimented with it with bone-in shank and also doing it in a slow cooker. Both require a longer time, maybe 6 hours, but work well. It’s a pretty forgiving recipe! I’m ready to try the Beef Noodle Soup recipe, I’ll let you know how it turns out. The chicken soup recipe is a home boiled chicken recipe. You bring the chicken to a boil, dump and rinse the scum. Then you add sliced diacons and regular carrots and a sliced scallions. My wife calls diacons white carrots. Boil for about 1 hour until the radish and carrots are tender. Before serving, add some Shoaxing cooking wine and some chopped cilantra and simmer for a few more minutes. Unlike the Taiwanese that prefer sucking the bones clean I prefer boning the chicken out so I can remove the bones in the end which makes serving to my small kids much easier. You can also hold back some of the raw meat and add it later when you heat it up again if you want to serve some of the soup the next day. I find that the chicken meat gets too dry if you boil it too much, especially the breast meat.